Thorens has a history of turntable manufacture that runs unbroken back to the first days of turntables. OK, so the company ownership has changed hands, it now concentrates solely on turntables, and the products today are no longer manufactured in St Croix in Switzerland, but the Thorens name has been associated with turntable replay for the last 114 years. Many look to the classic Thorens turntables of the 1950s and 1960s as a Golden Age (and products like the TD-124 command very high prices even today). Thorens 900 series is designed to continue in that tradition, and the TD-907 is the very top of that 900 series tree. The 900 series extends the suspended sub-chassis further into the main Thorens line. This suspended design has long been available in the chrome TD-550 and the long-standing TD-350, but these models are both long in the tooth and cater for very specific audiences. The 900 models are designed to tick the heritage box, without sacrificing sound. 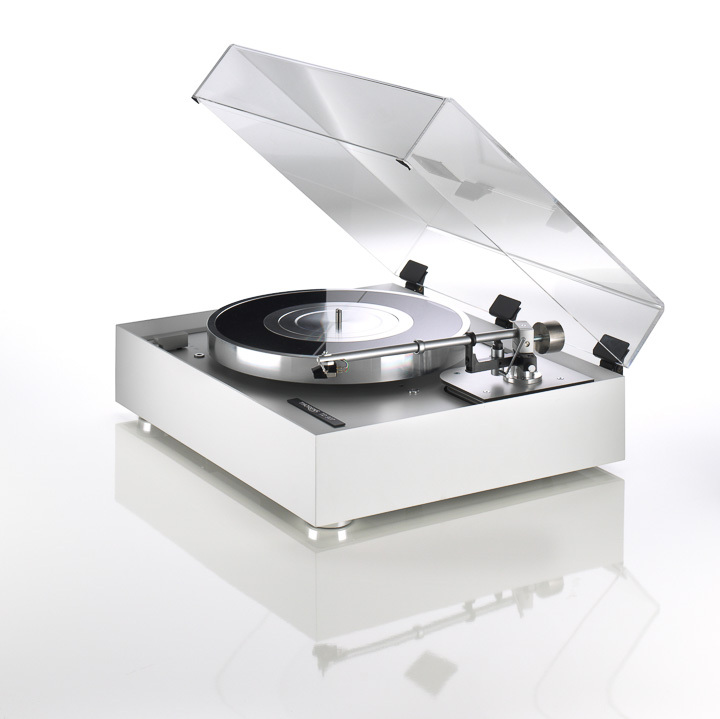 Where the other models in the 900 series feature acrylic platters, the top of the tree uses a three-part aluminium platter, albeit with an acrylic insert that acts as a damping pad for the record itself. This looks more elegant than the usual felt mat, and in theory combines the advantages of both felt and acrylic. The sub-chassis itself is made of triCom, an aluminium/POM (polyoxometallate) composite, which is claimed to deliver excellent damping properties and high stiffness. Its weight has been further optimised for high performance. To reduce vibrations, the synchronous AC motor is mounted directly onto the damped sub-chassis, with a separate external power supply connecting to the motor and on-deck speed control via a locking four-pin plug. The motor drives the sub-platter via a machined precision belt, and there are fine-tune pots built into the rear of the chassis for adjustment of 33 and 45 rpm. This sub-chassis is suspended by means of three conical springs, which can be adjusted from above in order to achieve uniform tension. Those who have spent time under a turntable clamped in a jig trying to level the design appreciate the relative ease of this kind of adjustment. Meanwhile, the bearing is made of sintered bronze with a Teflon thrust pad, which is optimised for smooth running. The supporting steel axle is claimed to provide a very low, constant friction in order to present a uniform load to the motor. Two of the turntable’s three feet can be levelled from above, which also facilitates ease of setup. The key feature of the TD-907 is its ten-step adjustable pneumatic damping architecture. This features a conical polypropylene membrane under the platter bearing, which is decoupled from the triCom base via a visco/propylene layer. The air chamber formed under the membrane vents into ten apertures in the base plate that can be opened or closed with a slide mounted to the rear of the turntable. Strangely, the manual for the 900 series (in all other aspects very comprehensive) is completely silent on the damping system. We’ll discuss its effects later. It’s possible for a listener to start with the basic TD-903 and upgrade it to the 905 and thence to the 907, but we’d recommend just going for the big guns right out of the starting gates.